Innovative Power Products introduces their Model IPP-8041, a 200 watt, 36 dB, Surface Mount Dual Directional Coupler that operates from 500 – 2500 MHz. 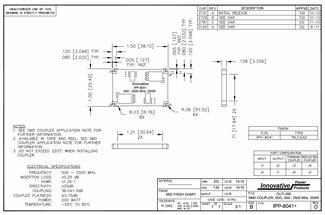 The IPP-8041 is a unique broadband design which provides separate coupled ports for both forward and reflected signals with internal Terminations. This coupler is produced in a Surface Mount (SMD) package size of 0 1.50 x 1.00 inches. 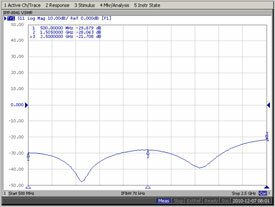 Insertion Loss is less than 0.25 dB, main line VSWR is less than 1.25:1, coupled flatness is +/- 0.75 dB and directivity is greater than 20 dB. 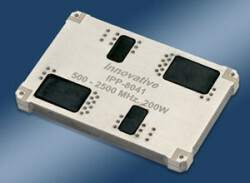 IPP also offers 500 – 2500 MHz. 90 Degree Couplers, 2 Way Combiners, 4 Way Combiners and higher power Dual Directional Couplers up to 500 watts. Delivery: 4 – 5 weeks ARO. For pricing or additional information, please contact the Sales Department at 631-563-0088, or email us at sales@innovativepp.com.